With the Fourth of July just around the corner, you need to be mindful of how your dog reacts to fireworks and take this into consideration when planning Independence Day activities. For some dogs, fireworks are a non-issue. For others, including hunting dogs that are used to loud noises, the thunderous booms that accompany the flash and sparkle of pyrotechnics can be a tumultuous experience. 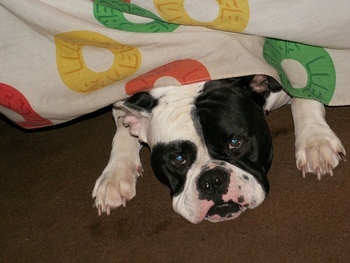 The stress experienced by dogs during fireworks often triggers the fight-or-flight response. The loud noises usually make the dog want to leave the situation – animal-control services see a 30-percent increase in lost pets during July 4-6. While you need to take the appropriate steps to keep your pet safe and secure, you have to realize that the stress also increases the chance that your normally lovable dog might bite. To keep your dog protected, make sure you provide a safe place for it during the holiday season – their crate is an excellent spot that is very secure both physically and psychologically. Always leash your dog before going outside to reduce the chance of losing them should they bolt because fireworks. Also, try to find them as quiet of a place as possible to spend time – your basement or any interior room that is insulated from the noise outside are good choices. If your dog does struggle with fireworks, understand that adding lots of people to the situation will only increase his anxiety; having a party won’t help. If you have to entertain a large number of people, consider kenneling your pooch – the pack mentality of many dogs unaffected by fireworks might actually help reduce his fear. But, even if you only have a few people over, make sure they understand that your dog isn’t himself during this time and not to crowd him (again, removing him from the situation is probably a good idea). Cesar “The Dog Whisperer” Milan has some excellent insights into helping you and your dog get through the fireworks season. His recommendations on physical activity and distracting your dog with known commands are excellent ways of reducing stress and anxiety in your dog. Desensitizing your dog to loud noises and strange smells can also help. As Milan points out, it takes time to do it, but with positive associations, persistence and a gradual increase in volume, it can be done. While it’s likely too late to desensitize your dog this year to the excitement surrounding the birth of America, taking a few precautionary steps and planning for next year can help both of you make it through a few days of excessive noise. *Photo courtesy of Cindy Funk via Flickr. How Hot Does it Get in a Parked Car? Thanks SO much for these helpful tips. My big girl, Phoebe, is a 4-year-old Golden mix. Last year she started getting scared of the fireworks and this year they've already started and she hates them. Our little one doesn't seem to mind, but he tries to comfort his sister. Very sweet. Glad you enjoyed the piece and hope the tips help somewhat. It's interesting that her anxiety started taking place last year. Did something happen to cause it (close proximity to one going off)? Personally, I'm a big fan of Cesar Milan's suggestions. Do something ordinary and known to your dog -- obedience work is GREAT for helping a dog cope with many situations; they're known commands the dog can carry out easily, they distract the dog (especially if incorporated with rewards) from the background noise/situation, and it also works on the dog psychologically -- he understands his role, is working and everything is as it should be: you're in charge and since you're not affected and are 'working,' the dog doesn't feel anxiety because YOU are acting differently. Keep it simple, positive and act like nothing is going on. The worst thing you can do is pander to the dog and reassure it as you would a human child...dogs don't think like humans and acting in that manner can actually feed the dog's insecurities. Act normal, have your dog carry out normal tasks and pay no attention to the fireworks -- which is much easier if the dog is in an interior room that mutes the noises and vibrations. Hope you and Phoebe have a happy and enjoyable 4th of July holiday!